In 2008, Columbia Pictures released The Social Network, directed by David Fincher. In the months leading up to the release, many scoffed: we need a movie about Facebook now? So soon? It felt weird. Likewise, when it was announced that Kathryn Bigelow, fresh off the success of the career rejuvenating and award winning film The Hurt Locker, would start work on a movie, Zero Dark Thirty, about the capture of Osama bin Laden, it again felt weird, premature. Not to conflate the worlds of social media and terrorism (though, depending on who you ask, that essay could probably get written), but both films achieve something significant in the face of various levels of skepticism. They speak of our current time and place, our society, and end on questions that ask of the cost of actions taken, of where we are heading next. This is no small feat, and in the case of Zero Dark Thirty with the stakes significantly higher and access, one would assume, much more restricted, it feels almost impossible that it could be achieved at all. Unfolding over a ten year period, Zero Dark Thirty shines a light on the complicated maze that was the hunt for Osama bin Laden. It begins with an inspired blacked-out sequence of radio chatter on the day of 9/11. No images necessary, you can use your imagination. It ends, as promised, with the assault on bin Laden’s compound in Abbottabad, in what is surely one of the most tense and technically brilliant – no imagination necessary here – sequences in film for some time. In between, are the steps that got those soldiers to bin Laden’s doorstep. 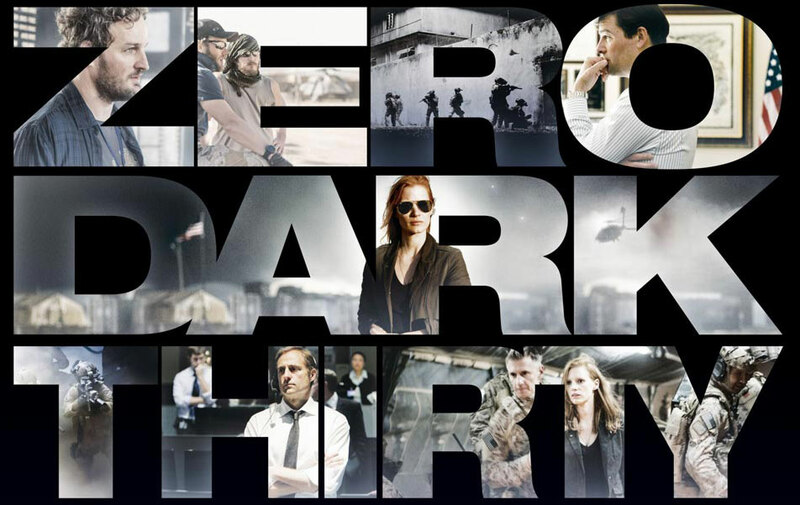 Zero Dark Thirty is about the process, the procedure, the endless hours spent chasing down leads and shady characters, starring at computer screens and files. As in any procedural film, it is the details that matter. And to that end, Bigelow, working again with writer Mark Boal, appears to be uniquely suited to the task. Boal’s script is laced with the sort of jargon that works in such an effectively succinct way. The audience is dropped into conversations in progress, names and faces are introduced with little fanfare, a web is being weaved but we can’t see the pattern; and yet we are swept along by the shear dynamism of it. Meanwhile, Bigelow, much as she did in the Hurt Locker, goes for a gritty, verite style that, more often that not, does not shy away from the dirty ground-eye view of this ugly conflict. Yes, there are scenes of torture in Zero Dark Thirty, presented with little comment (either for or against). Sometimes it appears that the torture produces results but other times it leads no where; and with the amount of bombs that go off in the film, it feels like a psychically costly tactic. Providing an even broader picture, the film charts the changing political tides, the internal shuffling of CIA personnel, the 2004 and 2008 elections far, far in the background, and the growing sense of restlessness. How could bin Laden elude us for so long? The minutia of the film extends to its characters as well. We meet CIA agents like Dan (Jason Clarke), who are willing to execute torture, but also, through subtle words and actions, show they are clearly affected by it. There is Jessica (Jennifer Ehle) desiring so earnestly to connect the dots that she, perhaps, loses sight of the danger staring her right in the face. Others, higher up the ladder like Joseph Bradley (Kyle Chandler) and George (Mark Strong) question and probe, grappling with the politics roiling about them, and the violence that threatens to explode beneath. It is again a credit to Boal’s sprawling yet concise script and Bigelow’s terse direction (2 and a half hours fly by) that we even learn who these people are. There is no hand-holding guide in this labyrinth. The audience must come to the characters, their moral choices and the mood of the film. What we take away from Zero Dark Thirty depends on us. Yes, there are a lot of names and faces in the film, and a lot fine detail, but the star, the impossible-to-miss standout, is Jessica Chastain. Brilliantly cast as the seemingly weak Maya, Chastain is the backbone of the film. Her introduction in the film is in disguise, hiding her identity from a man about to be tortured. She steps outside this desert dungeon and re-enters without her disguise. She is ready to look everything straight in the eye. An hour or so later, after more terrorist attacks are shown around the world (some of them affecting Maya more closely than she anticipated), she looks at a co-worker and says “I’m going to smoke out the operation. And then I’m going to kill bin Laden”. It is a moment of pure determination, spoken so fiercely, the audience has no reason not to believe. The character of Maya becomes one of blazing, go-for-broke, quiet ferocity and Chastain, looking diminutive next to Edgerton, Pratt, Ramirez, Clarke, Strong, Gandolfini, Duplass and the rest, stands taller and eventually looms larger. It is a masterful performance. Excellent Review! I wasn’t sold on seeing this movie (mostly because my utter disdain for rah-rah Americano movies and mediocre enjoyment of “The Hurt Locker”), but I think I will check it out now. Cheers!